Sometimes, I am caught off guard- and suddenly realize how much of a blessing it is that my children gets to see where some of their food comes from. As I recall, a neighborhood child saw me pulling a potato out of the ground once, and exclaimed "potatoes come from the ground?!?!" I let them give it a try, and it was like finding buried treasures for them. I'm convinced that once you realize how these foods are made, how long they take to grow, and how much work comes into harvesting them - you grow a definite appreciation and value. Along those lines, every year we try to go on a few day trips that involve some U-Pick establishment to save money, and give us excuse to go on a road trip. So let's mosey on over to our recent adventure. Picking blueberries, and making blueberry Jam. Every year we try and make it over to stateline blueberries in Michigan City, IN. The place is owned by a teacher, and she spends her summers running the U-pick and the rest of the year well, obviously - teaching. I have seen over the years her small children grow up from manning the small hut/house to now driving the picker. Here's a branch to show you how ripe the berries were, and how LARGE they were! We ended up with about 30 pounds of blueberries. Some for us, some for grandma and grandpa, and a little more for us. Crush blueberries one layer at a time. 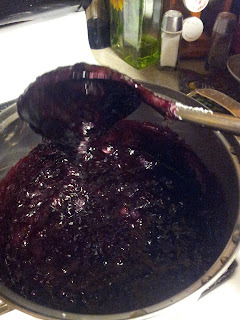 Combine crushed blueberries and powdered pectin in a large saucepot. Bring to a boil, stirring frequently. Add sugar, stirring until dissolved. Stir in lime juice. Return to a rolling boil. Boil hard 1 minute, stirring constantly. Remove from heat. 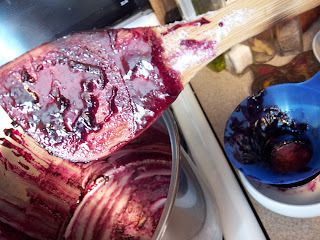 Ladle hot jam into hot jars, leaving 1/4-inch headspace. Adjust two-piece caps. Process 15-20 minutes in a boiling-water canner. Yields about 6 half-pints. 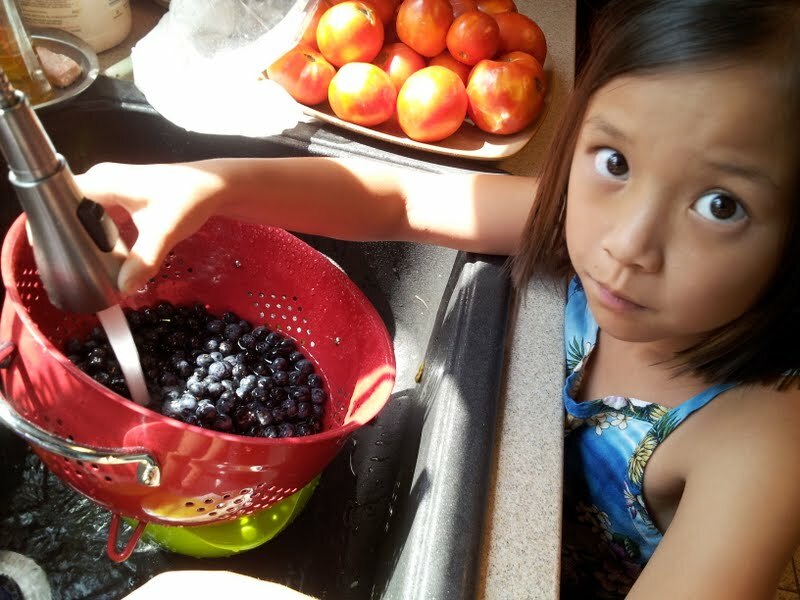 Here's Momsi washing the berries. I caught her just as she looked at the camera. Awwwww what a face. 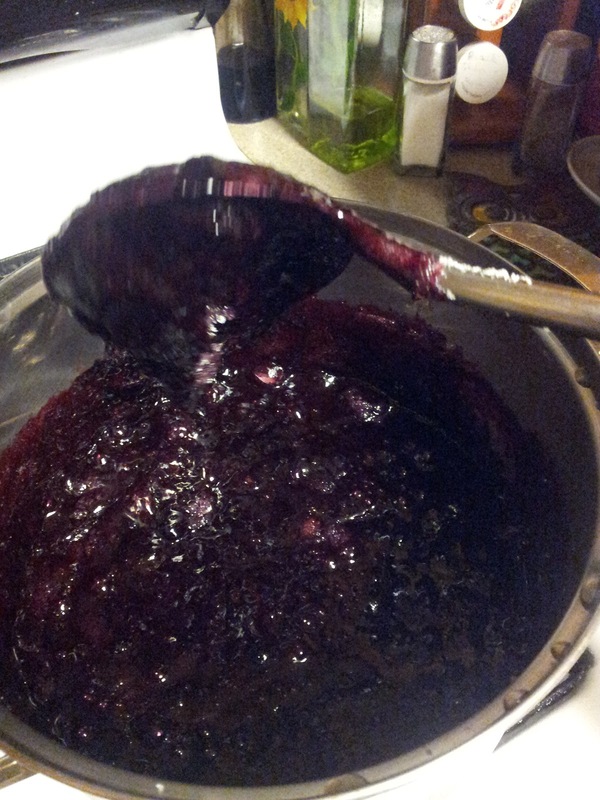 Here's the jam thickening after all the sugar and boiling. A cooled spatula showing the consistency of the blueberry jam. Made several batches, and glad to say every jar sealed properly. I encourage anyone to try this recipe at home. Probably one of the easiest jams I've made and the children grow an appreciation for the amount of labor and fruit that is involved in just making 1 jar of Jam.